Bujera Fort, Udaipur, Rajasthan, India. 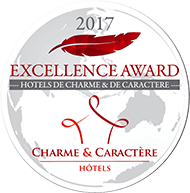 Recommended by Condé Nast Traveller. Constructed on purely traditional lines, with eighty six hand carved stone columns and many Jarokas in local stone. Virtually all the doors and windows are salvaged, creating the feeling of being in a centuries old building. 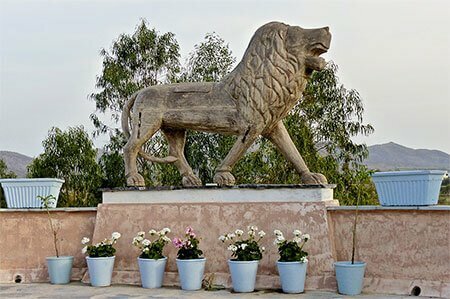 Udaipur's only boutique hotel and a gem of a place, is situated on the edge of the small village of Bujera, with distant views of the lake and city. Truly gorgeous, small, friendly and welcoming. The inspired creation of outstanding interior designer Richard Hanlon and Trish McFarlane, it has immense style and sophistication throughout. 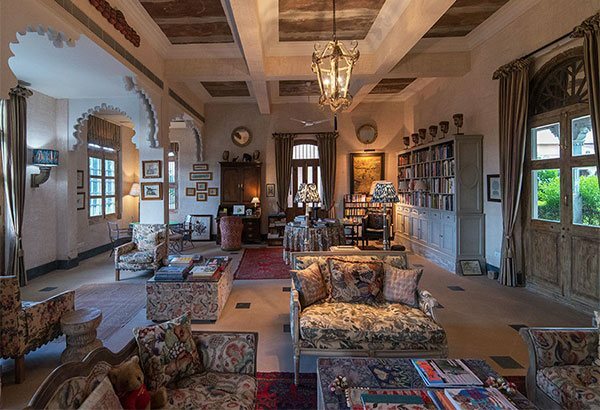 The Fort has all the feel and atmosphere of a glorious English country house with wonderful fabrics interspersed with Indian antiques, fabrics and "style". You will only find the best mattresses, pillows and bed linen here,comfort being paramount. In summer there is full central air conditioning and in winter there is heating, working fireplaces and hot water bottles for those chilly winter nights. The Fort is run so that it feels like your own home, with full, but unobtrusive service and staff to make you feel totally cared for, but not smothered. The front office is tucked away to emphasise the feeling that this is your home, but is there to fulfil your every need 24 hours a day. 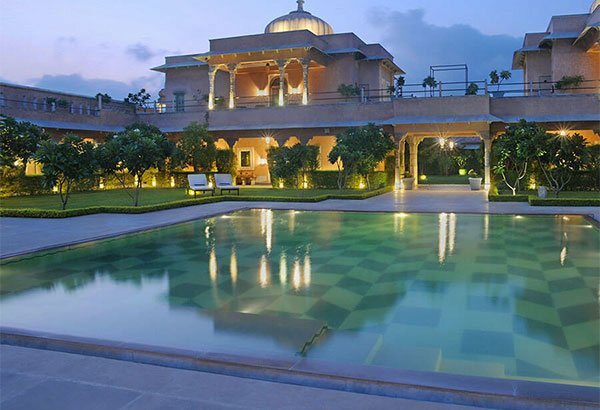 In the central courtyard there is a swimming pool, beautifully designed like a step well. Surrounding this are flower filled gardens with many secluded areas and fountains – a dreamy place to read a book or contemplate the views. Inside there is a library, a games table and a varied selection of books with its working fireplace for colder winter evenings. 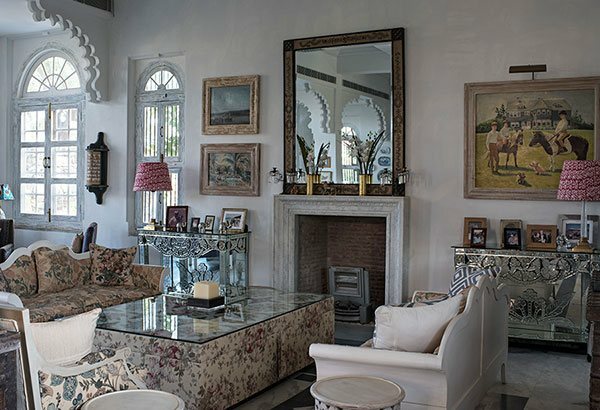 A drawing room with a silver grand piano and a breakfast room for dining when the weather is fresh. There is a private dining room for those special occasions & dining pavilion where meals are served. There is not television in the rooms, but there is one in the library. The standard check-in time is 2:00 PM & check-out time is 11:00 AM. 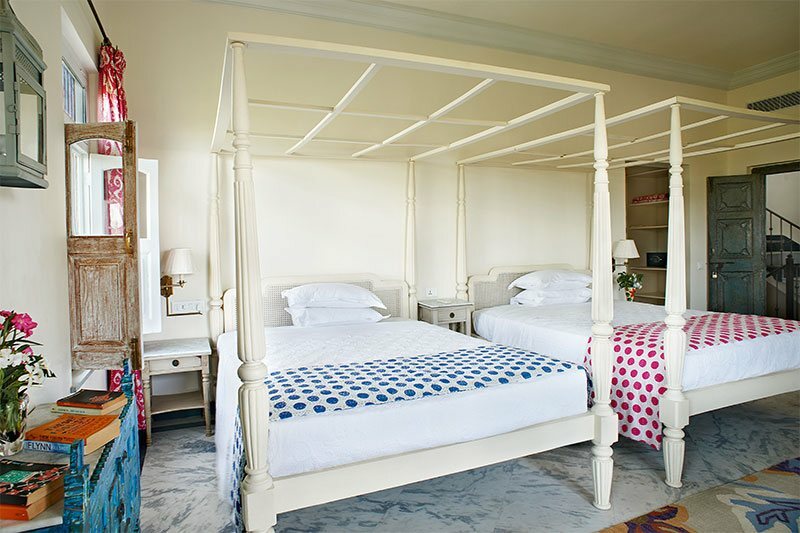 Cloister Rooms with luxurious beds, pillows from the white company, marble bathrooms with bath tubs. All the cloister rooms at bujera fort have private balconies. There are three double bedrooms (two with balconies) & the ground floor with a french window opening into the cottage garden. 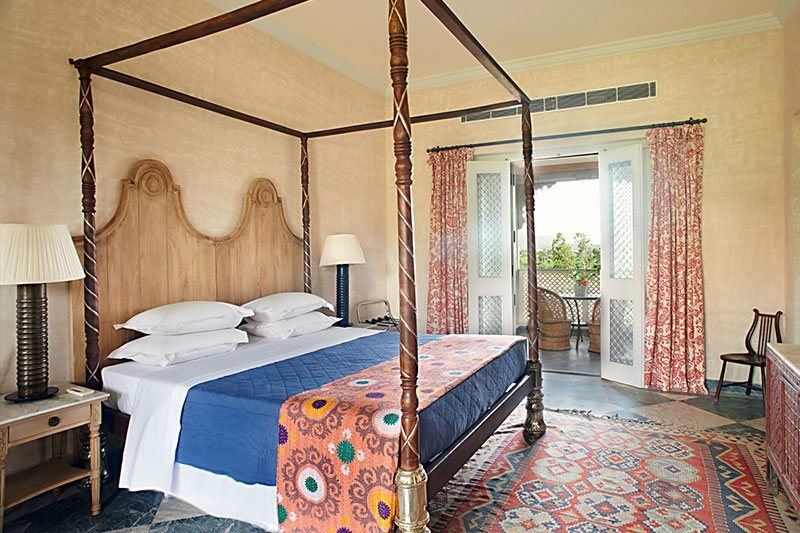 It is set within a very pretty, private walled garden with a plunge pool and deep verandah, dining pavilion. The suites have marble bathrooms with separate bath tubs and marble shower. Two large master suites, each suite having two glamorous marble bathrooms, and working fireplaces. They have private balconies. Our stay at Bujera was the highlight of our visit to Rajasthan. Welcomed upon arrival by Richard and his ever smiling crew, it was like being invited into the home of a friend. A friend with exceptional taste of course. 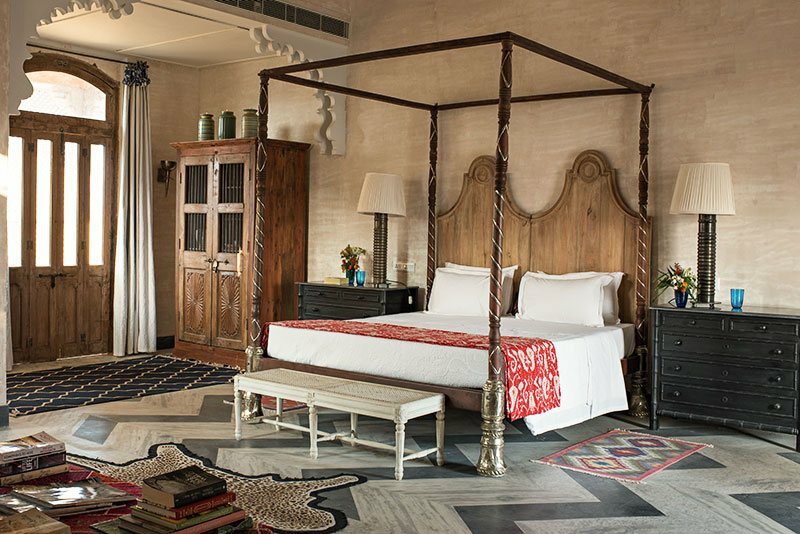 Designed and built lovingly over 6 years by British Interior Designer, Richard Hanlon, and his partner Trish McFarlane, Bujera is the harmony of Rajasthani architecture with traditional English touches -- it is both grand and sophisticated, hitting that sweet note of laid back luxury. Mystical luxury fort under the starry night sky. This is the best example of recreation of history. The entire resort has been built using old material bought and restored. The owners and managers would go overboard to make your stay comfortable. The resort rooms have no telephones or televisions and we didn't realise that until we were checking out. There is a nice library and the verandah to sit and just relax. This is an ideal vacation spot. Don't go there as a tourist, you will be disappointed. Bujera Fort was an incredible experience, from beginning to end. Richard, who is the owner and creator of this stunning property, greeted us on arrival with his charming staff. For me this was a stay of a lifetime experience, a treat for my 40th birthday with my Mum, Auntie and two friends. Richard kindly upgraded us to our own 'house' three floors including lounge, private garden, three bedrooms and a roof terrace to see the sun set. It was utterly amazing. The design of Bujera Fort is exquisite, the service and guest care is wonderful, the highlight of my recent 3 week first visit to India. I highly recommend Bujera Fort...thank you for an amazing experience. I will happily return in 2017! Copyrights © 2017-18. Bujera Fort. All Rights Reserved.